Ages: 14+ recommended for independent operation, any age with supervision. 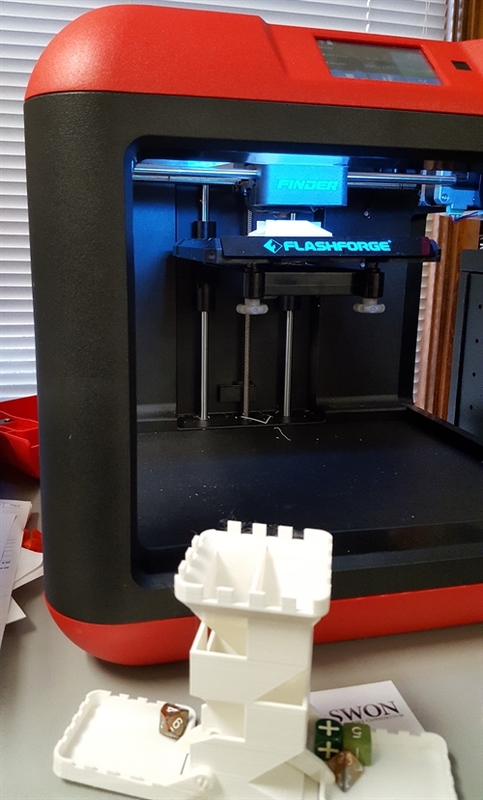 Description: Getting started in 3D printing with Finder is easy and affordable! Finder is capable of printing right off of a flash drive - just plug in and go! All the heated elements are protected from touch, and the printing material is non-toxic PLA. Finder is the perfect starter 3D printer for families, schools, and novice users. Finder sports a 3.5-inch touchscreen right at the top of the printer with big, easy to understand controls. With only four taps you can get a print started, no need to hook it up to your computer! Real-time printing status is displayed so you know when your job will be finished. Our printer comes with at least one roll of filament, and you can order extra when you reserve online. Included with all SWON Tech to Lend are online resources, including manuals, instructions, lesson plans, examples, & curriculum which can be found through Google Drive here. To borrow, please check the calendar below for open dates and then go to our Tech to Lend page to register for your items.